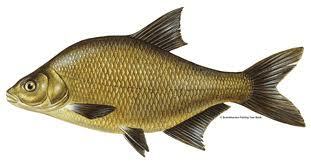 The bream is an angler's favourite. Why? Because if you catch one there's a very high chance you will catch another. And another. And more. Bream are a shoaling species. They are the equivalent to an underwater herd of cows, travelling together and feeding slowly, methodically and ravenously. They grow quite large and will very quickly mop-up a massive amount of food when a shoal of bream move over it. Bream can reach very impressive weights when living in food-rich waters, or those that are heavily fed with high-protein carp bait. The current record stand at an enormous 19lb 12oz.